Shasta’s Story Round-Up: Happy New Year! 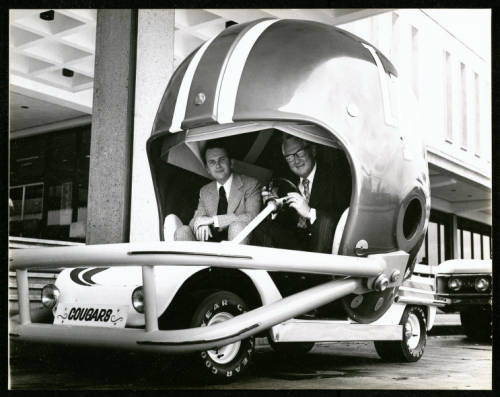 President Philip G. Hoffman and Rep. Price Daniel, Jr in a custom built club car. September 25, 1972. Special Collections, University of Houston Libraries. University of Houston Digital Library. As a freshman at that College of Natural Sciences and Mathematics, Thomas Markovich (’12) authored a research paper in a major peer-reviewed physics journal. Now, he’s pursuing a Ph.D. in physics at Harvard University, and continues to champion his undergraduate alma mater. Know a Cougar we should profile? Contact us at lunarcougar@uh.edu! To read more great alumni and donor profiles, or to make a gift to UH, visit the University Advancement home page.